Spray 1 1/2-quart slow cooker with cooking spray. Place chicken in slow cooker. Top with remaining ingredients except pasta, cheese and parsley. Cover; cook on Low heat setting 4 to 5 hours. About 30 minutes before chicken is done, cook and drain pasta as directed on package. Serve chicken with pasta. Garnish with cheese and parsley. Chicken thighs are a great choice for slow cooking, as the dark meat stays moist and flavorful. Boneless skinless thighs are now readily available at most grocery stores. If you prefer, you can substitute boneless skinless chicken breasts. 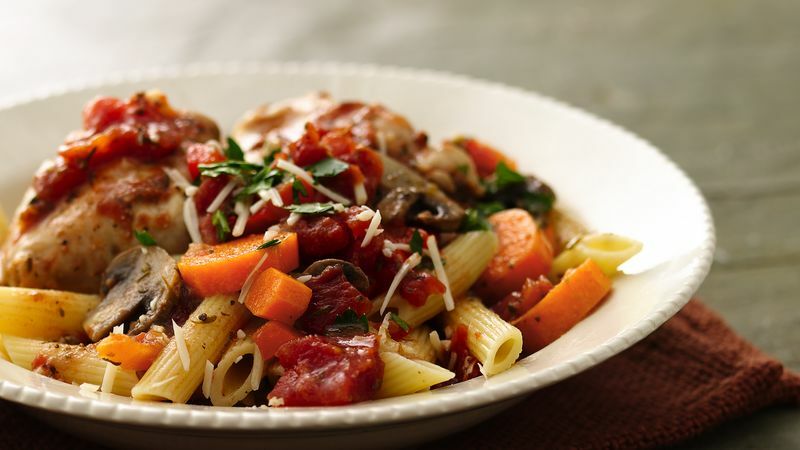 Try whole grain penne or another whole grain pasta shape for added nutrition. Or instead of pasta, serve this chicken with garlic mashed potatoes.